Nationwide, German restaurants are increasingly becoming an endangered species. A Washington Post story outlines German cuisine’s struggle for relevancy in 2018, and ticks off long-standing brat spots that have had to say auf wiedersehen in the past few years. What’s to blame? German restaurants, the piece explains, feel old-school. Younger generations of diners perceive the food as heavy, boring, and brown, and the restaurants’ atmospheres aren’t perceived as much hipper. 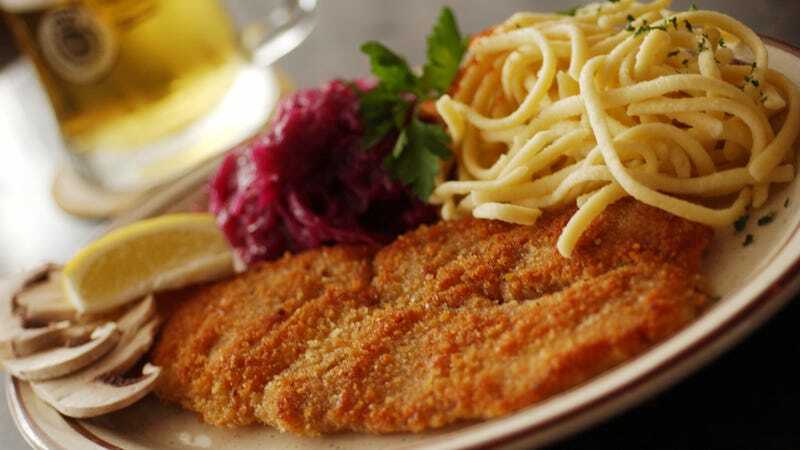 Steins and schnitzel seem like the stuff grandparents would be into, and it’s keeping younger diners away. My small city is lucky enough to have a really tasty—and popular—German restaurant attached to a brewery. Even on St. Patrick’s Day weekend, I found it packed with families and groups watching March Madness on the bar’s TVs. This encapsulates what the Washington Post article says might save German food in America: beer. While German restaurants struggle, biergartens are thriving. They usually have a smaller menu and focus more on beverages and less on traditional food. While they represent a rare bright spot for German food, owners tell the Washington Post that their menus are rather watered-down: pretzels, cheeses, brats, not the more ambitious and authentic German fare like specialty sausages or pigs knuckles. While it saddens me that a generation of younger diners may grow up without knowing the joys of landjager or maultasche, I can see why pigs knuckles wouldn’t rank high on their must-try lists.